The Mother Generosa McCafferty Distinguished Alumna Award is presented annually to an outstanding alumna of Catholic High who demonstrates each of the Franciscan Core Values of Personhood in Community, Loving Service, Ongoing Conversion, Witness to Justice, Peace and Reconciliation, and Stewardship. The purpose of the award is to recognize the alumna for her individual achievements, contributions to her profession, service to her community, and loyalty to The Catholic High School of Baltimore. The Lux Tua Luceat Service Award is presented annually to an outstanding alumna of Catholic High who demonstrates each of the Franciscan Core Values of Personhood in Community, Loving Service, Ongoing Conversion, Witness to Justice, Peace and Reconciliation, and Stewardship. The purpose of this award is to acknowledge an alumna who has a history of service to others through significant leadership in public or community endeavors, including church as well as service and commitment to The Catholic High School of Baltimore. This alumna best exemplifies the mission and vision of Catholic High through the application of her education, initiative, and humanity to socially useful ends in the community, nation or world, and continues to Let Her Light Shine. The Distinguished Recent Alumna Award is presented annually to an outstanding alumna of Catholic High who demonstrates each of the Franciscan Core Values of Personhood in Community, Loving Service, Ongoing Conversion, Witness to Justice, Peace and Reconciliation, and Stewardship. 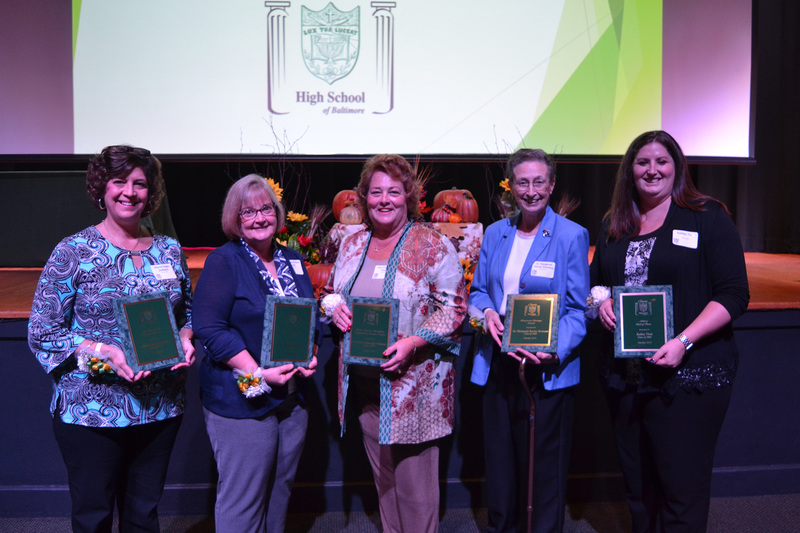 The purpose of this award is to acknowledge a recent alumna who has attained exceptional accomplishment in her occupation and has performed distinguished service that brings honor to the recipient and Catholic High during the first 15 years following graduation. The Franciscan Heritage Award is presented annually to an outstanding alumna of Catholic High who demonstrates each of the Franciscan Core Values of Personhood in Community, Loving Service, Ongoing Conversion, Witness to Justice, Peace and Reconciliation, and Stewardship. The purpose of the award is to recognize the alumna for joyfully serving the poor, leading initiatives for social justice, empowering others to reverence creation, and giving witness to the Franciscan spirit in the world.